We've all seen what Roger Federer looks like hitting a ball: his head turns back to the side and tilts a bit, his eyes look soft, his head doesn't move. And we all know his swing never seems rushed, he sees the ball well and retains extraordinary balance, he doesn't over swing, and boy does he keep his head and eyes still. Tim Henman says, "I can watch when I'm playing him and there are certain times where I will hit a shot, I will be at the net and it almost looks he's got a split second longer than most other players... Sometimes he comes across to hit a backhand pass when you feel like you've hit a good approach and it's like he has got a bit longer to hit it [Tennis News, Jan 15, 2005]." Observers on Federer's hitting method note he hits the ball way out in front, and while one handers do this more than two handers, they note his forehand timing seems more out in front than most. While footwork and balance can be dissected and their salient points noted in Roger's form, his vision technique remains unexplained. And perhaps it is his vision technique that is responsible for the talent he shows in other areas. The pro purposely takes the eyes off the ball at the last minute to look at the opponent's position. The pro is legally blind for the ball's last few feet of flight and thus can not ever see it. The pro lacks the right vision awareness techniques how to see the ball for the contact. To keep it simple we know we should keep the head still, watch the contact and not the ball, and try to be in control instead of the ball being in control. If we can do this organically without having to deal with extra stuff that would be perfect. But how? When I first saw Federer's head going backwards during contact I thought he was incorporating an old tennis axiom used for backhands to help you see the ball, namely to turn your head back away from the racket at contact so you're looking at empty space behind the racket or down at the court surface below. The advice meant to help steady the head and not lift the eyes off the ball at contact. Some guys actually did this very well, but no one did it on forehands. Why was Federer doing this on forehands? I didn't get it. We're all taught to "see" or "watch" the ball into the string bed in one way or another. Most of the time it's "look at the ball hit the strings," "out in front," sometimes nothing specific as where to look, or "see the blur." I teach "see" the ball when it's in front of the racket at contact, other pros may give other cues. For some players it's just instinctive but of course there's an explainable structure to it using vision science terminology. But predominantly we "see" the ball when the ball's in front of the racket. Either we're sneaking looks over the edge or ahead of the racket for this, or we look forward. Perhaps the large number of photos showing the pros' eyes looking forward at contact instead of the string bed offers proof of this process. Federer doesn't look for the contact in front of the racket, he looks for it from the back of the racket as the photos indicate. The back of the racket lies between his eyes and ball contact, his visual focus for contact goes to the back the racket and not the front as everyone else does. Though at times the ball may be visible during contact through the string bed from behind if the ball's high enough it's really looking from the back of the racket that primes this technique and not a desire to actually see the ball hit the strings. Federer is not trying to see the ball hit the strings, he is in fact seeing the racket hit the ball, specifically seeing the back of the racket flashing through. To me it seems like Federer purposely references the contact spot from the back of the racket, from behind the string bed, even though he might not characterize it this way. His head does not look backwards to empty space, his eyes don't look down past the contact spot to the court below. He might be unaware it seems like this but when I decided to look at the contact this way...! This may be the genesis to balance, stability, and timing. Curious indeed. The results were striking. My timing improved without thought, my balance and spacing improved without giving it a thought, everything I hit felt good and cleared the net, my shots went up but then came down with more top, I just seemed so much more in control. It couldn't be this easy, but at least for me it was. It is at the last minute when the head tilts back to capture, or look at, the back of the racket coming through. My eyes went very soft, my balance was enhanced tremendously, and for some reason my wrist usage was less labored. I hit the forehand farther out in front than I usually do but oddly I was not rushing; on my one handed backhand this technique helped to reinforce hitting out in front and it made it much easier to do. Comparison photos explain well. Agassi's timing is excellent and you can see his head tilts, but on a side by side with Federer you can clearly see he references, or registers, or expects to "see," the ball out in front of the string bed whereas for Federer it's clearly from the back. I invite you to review all the forehand contact looks in Step 8, including mine, and notice how we all "see" in front of the racket - looking forward isn't about being the last point we see the ball along its flight line (more in Rebuttal below). Backhand comparisons yield the same discovery. I know the camera angle has something to do with it but Federer's single photo, left, shows the eyes well positioned to capture the back of the racket between them and ball contact. It's quite clear that in the montage on the right, Henman, lower left, and Henin, lower right, clearly look ahead of the racket for their contact. And they are not alone. 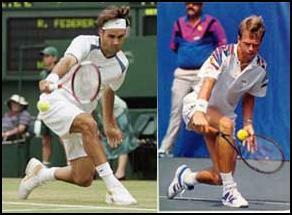 The side by side comparison of Federer and Stefan Edberg is interesting as well. 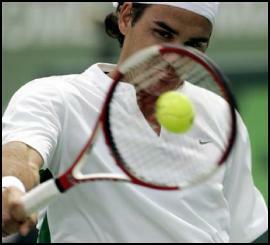 Stefan's head is more over both the ball and his racket's edge than Federer's in his picture. Federer's head is not tilting back but it is very much behind the racket. 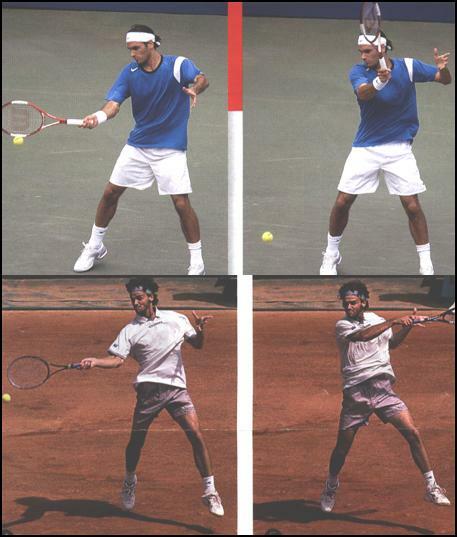 The timing of the contact is different between both photos, Federer's is more in front but that's part of this process. All the two handed backhand images clearly indicate seeing the ball in front of the string bed. Granted two handers hit later than a one hander, but I think it's still doable with a two handed backhand. Below you find two groundies from behind the baseline, Federer top, Kuerten bottom. 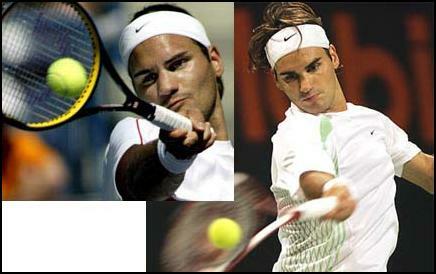 Federer at contact is looking at the back of the racket, the second photo clearly confirms this assumption. Kuerten's second photo clearly shows where and how he was looking, forward. Next photo, a low ball by Federer at the baseline and he still looks at the back of the frame at contact and after. Compare with Davydenko below him whose eyes are forward even though his head is behind the contact (and head not tilted btw). I have tried to illustrate this concept with my ball basket as the contact spot. The red line indicates the area where the eyes look for the contact spot -- In front of the racket or string bed (photos left top and bottom) -- From the back of the racket (photos right top and bottom). Students say looking at the back of the racket for contact means you have to hit sooner and look at the ball longer to make it happen. You're not tracking the ball any longer, it is the process of looking at the back of the racket for ball contact instead of the front that makes it seem longer. This process clearly keeps the head and eyes still longer before contact and makes it easier for you to prevent the head from jerking forward during the swing. And yes you hit sooner, which can mean hitting more on time. We all complain we either can't see the ball well, don't have enough time to hit the ball, or it's hard keeping our head still and eyes down when hitting. These complaints can now be ancient history. This all just might fall under the headings, "don't move your head when you swing," or, "hit out in front," like generations before did. If so maybe this technique helps keep the head still and hit out in front better with today's faster game, more severe grips, and bazooka rackets. Beginners are often taught to volley looking at the ball through the string bed from behind as a way of learning to hit out in front, but this idea is never carried over to the other strokes. Instead of focusing on the ball hitting the racket now your mental focus changes to the racket hitting the ball. 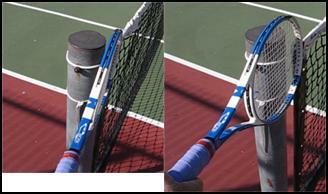 The two pairs of racket-only images on the right -- top (racket above court), and bottom (racket on net post) -- try to show the difference in my visual focus when hitting the ball looking for the contact in front of the racket (photos left side, top and bottom), and my point of view looking for the contact from the back of the racket (photos right, top and bottom). The blur of contact will now be the entire back face of the racket coming forward into the ball instead of the millisecond contact moment of the ball meeting the front of the racket edge. Having said all this it is still necessary to reference the contact spot as outlined in Step 7. In Federer slow motion video it is possible to see his head turn back a bit more prior to the actual contact. He seems to reference in advance the spot from the back of the racket (and through the string bed). This agrees with the sophisticated "jump saccades" of vision science (more below). Still... Still... You must keep the head still during contact, up until the follow through is mostly done, but luckily it's easier this way for two reasons: 1. the head is weighted in a counter direction by tilting back, 2. the hit has the potential now of being so sweet that it's simply foolish to mess with it. Don't sneak a peek! Better balance, better timing, better stability. Looking at the back of the racket for contact keeps the head back, which in turn offers these benefits. Balance improves with the head back, the torso does not lean over or into the ball. Stability improves for swing speed and strength when balance improves. Timing improves when the head and eyes do not lean out ahead of the body or swing. You do not have to deal with these issues separately when using this vision technique, they come with the territory. Hit out in front more. Helps still the head, and eyes. Ball clears the net, guaranteed. Increased self confidence and willingness to prepare sooner. Experiencing the contact moment ("seeing" the ball) from the back of the racket meant I had to hit out in front more, but I didn't feel rushed in any way and I didn't have to think about it (you might, you probably will, but for how long?). I also was able to put the ball in a particular spot with Federer's I-know-where-it's-going-to-go-so-I'm-not-going-to-look-at-where-it's-going look he has. I had tried that before while referencing the contact spot in the front of the racket but flat-out couldn't do it. Running up to approach shots, no matter the height, when I planned to "see" the ball from the back of the racket I automatically slowed down and kept my spacing clean. My eyes were calmly setting better timing for the stroke, I was never out ahead of the ball in terms of rhythm and timing. Same for volleys and returns. DID FEDERER LEARN THIS METHOD OR ADAPT INTO IT? 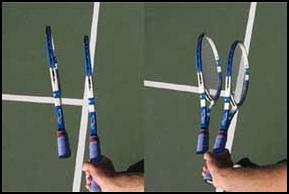 Today's game uses more powerful rackets and strings, mostly western grips (semi, almost, full), and is played by faster athletes. It all adds up to hitting with an open stance (to buy time), more body rotation (the player isn't moving into the ball but standing still, loading), more spin instead of driving through the ball (to keep the ball in with larger swings), letting the ball come in a little more for contact (players don't step into the ball), and wrap around follow throughs (to both lift the ball and take power off it). Backhands use more extreme grips as well. Vision technique that worked with wooden rackets or the advent of alloy rackets may not suit today's differences. Federer uses a variety of western grips and yet he hits off the front foot or times on it frequently by landing on it instead of keeping it bent up in the air like open stance hitters do, does not rotate wildly, drives through the ball and hits out in front unlike his peers. His vision technique is responsible for this, it gives him the time, the timing, the efficiency. Justine Henin hits way out in front on her backhand, but a quick google image search shows her eyes toward the opponent even when her head's clearly behind the racket. So what came first, a teacher telling Roger "out in front," "on time," "see the ball," "look down to the court," and he adapted, or was he told to see the ball from the back of the racket? Ask him. Is Roger the first one to develop a truly cleaner hit within today's faster game, greater spin rates, and western grips because he looks for the contact at the back of the racket instead of the front? Why do teaching organizations put sub standard stroke models in their teaching brochures when all we have to do is learn from Federer, or Agassi, or Sampras? In fact the forehand's potential is stunted when the forehand emphasis is to finish on the opposite shoulder, the emphasis needs to be on a clean hit. 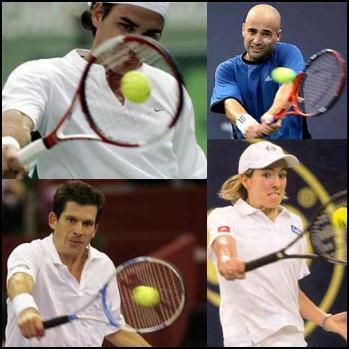 A major effort to describe vision awareness techniques for tennis players uses photos of pros with their eyes off the ball and looking forward as proof their eyes are "focused [not on contact but] instead on the last point [they] actually had the ball," and, "[the] eyes are focused on the last point [they] saw the ball along its flight line. And the last point [they] saw the ball is not the contact point." We're familiar with these photos, the pro's eyes are looking straight to the net when the ball's on the racket. This interpretation of the photos assumes the eyes have remained forward through the routine and excludes the possibility the eyes had already looked the ball into the string bed and are now captured looking out forward for various reasons. To exclude this as a possibility for this hypothesis we need to see all pre-contact photos as well. It is well known to teachers the head and eyes of their students will follow the ball in but then jerk forward during the forward swing prior to contact so why not with professional players? This major effort talks about variable and fixed depth of focus patterns and argues the "contact event" is a fixed, exact spot. But it is not because the "contact event" always changes in height above the court, changes in width from the body, and changes in depth between body and net. The three Federer forehands illustrates this best, all three balls are at a different height, different width from the body, and different depth between body and net. If the "contact event" changes there is no visual constant for contact regarding an area in front of your body, said area being empty space the eyes would focus on to "see" the ball hitting the racket. 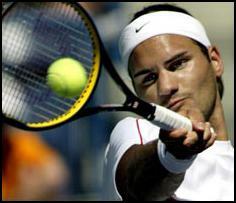 This effort's "Primary Contact Point" hypothesis as located "along a fixed focal place of your contact zone" does not give clues to superior vision technique for tennis players. If a visual constant does exist it needs to be found elsewhere. A lot of science regarding how the human eye sees has been introduced to our sport but, as earlier with biomechanics, we are told to adapt to it instead of the other way around because Ph.D.s who play tennis recreationally explain how their science impacts the game as they understand it. We have dispensed with certain biomechanic "truths" about power (lengthening the lever of the arm) and certainly more will follow. And now the idea efficient visual tracking means the head and eyes must be level, the head should remain above center of gravity and remain relatively still at all times, the eyes large, and a fixed focal plane for contact is being solidly refuted here. 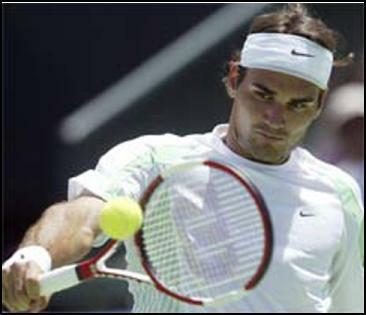 Furthermore, an opthamologist opines Federer's "visual focus has jumped back to the contact zone prior to the arrival of the ball in an eye movement called a "jump saccade," and that he is using his eyes to locate the contact point as the ball enters his contact zone. [Translation: Federer's eyes jump ahead, like you do when reading.]" This is no different than the simpler explanation in Step 7 to reference the contact spot, and as mentioned therein it is difficult to do but doing it Federer's way allows all of us to do it because it makes it so much easier (reasons follow). Federer's vision technique finds his head still but not necessarily straight or over the center of gravity, as is Agassi's above as well. Agassi's eyes are large, but not Federer's. Vision instruction in baseball is also convoluted. They want your "head down... eyes as level as possible... forehead should be down, not your ear..." [from a New York Mets hitting instructor] Photos of Andres Galarraga and Pete Rose's record breaking hit clearly show the head tilted, like Federer's, the eyes angled, the head back behind the contact spot, back ear down. Yes, tilting the head too much does impair vision, so perhaps scientists can look into how much tilt is too much. But straight, level? No. Here's a chance for baseball to learn from us instead of us always drawing analogies to baseball. Vision for tennis players is fluid. We can not stand still and prime our focus, nor does our target allow for that since it's moving away from us and our reach to it changes. Adjustments need to be made, calculations determined, and with milliseconds left we fire the gun. It's no wonder vision technique for tennis players is convoluted. Are in control instead of the ball being in control. Watch for the contact instead of trying to impossibly watch the ball all the way in. Keep the head still to the follow through. Something that is not moving away from them. Something larger than the tennis ball. Something other than the tennis ball to improve mental focus. A reference point in space ("jump saccade") that is real, not imaginary, with built-in flexibility for adjustments. Seeing the ball for contact from the back of the racket changes the entire dynamic. It buys you more time. It makes it easier to keep the head still. The reference point in space is real, it is the racket coming forward to hit the ball. It is a fixed point itself, a visual constant, but is adjustable based on the situation. It is easier to see the blur because there is more of it to see, here the blur is the back of the racket face. The eyes look at the (larger) back side of the racket face coming through and moving in the direction with your vision instead of the smaller ball against your vision. Contact quality is now in your control (the back of the racket is in your hand) instead of something out of your control (the ball moving away from you). Mental focus takes center stage, not visual focus, since now you watch for the contact instead of trying to watch the ball come into the racket and then be struck. Using this vision technique the head is not over the body's center of gravity nor is it straight up, eyes level. This is a new way to look at the ball, something even players like Tilden, Vines, and Budge would have enjoyed. Photos of groundstroke contacts from J. Parmley Paret's 1926 book clearly show the head looking forward, at times even ahead of the racket. Bjorn Borg is the only pro cited in the book "Hitting Blind" (Stein/Slatt) who sees the ball into the string bed. Curiously it appears he's seeing the ball from the back of the racket instead of in front, his head is back and his eyes aren't looking forward. Judge for yourself, but his rep was he did keep his head "down" longer than the rest of us. The new visual awareness how-to ideas lack a simple, organic focal point grounded in reality that ties everything together and easily allow everyone to do it. Looking from the back of the racket is that simple focal point, and at the same time it is the framework on which the science of vision can explicate all its knowledge. You jump ahead visually (jump saccade) but you use the back of the racket as your landing pad and not an imaginary spot in empty space. This is how that requirement becomes far easier to do and accessible to all. The end result? Your mental focus improves exponentially because now you indeed watch the racket hit the ball instead of trying to watch the ball come into the racket. Top players have played very well, haven't they, these past two centuries looking (or trying) at the front of the racket for contact. It just shows what you can get away with it if you're athletic enough, vision requirements may not be that do-or-die after all. Connors has his eyes off the ball but unlike you and me his kinesthetic awareness and hand-eye coordination did a better job of filling in the gaps. But what if we learned of a new understanding? I will now concede to my buddy Vic Braden the difficulty - he says impossibility - of seeing the ball (blur) at contact in front of the racket and stop trying to. There's a better way to do it, there's an easy way to "see" the ball. I see the back of the racket coming through forward into the hit... and at times a bit of blurry green. Roger Federer shows us a way we can all emulate to our advantage. Sure we won't be as quick around the court, as strong in our hit, or as graceful overall as he is, but we can see the ball like he does and enjoy better timing, better hitting quality, better results. When you see the ball better a whole new you shows up to play, and it's a lot more fun. So go out and have more fun, and send Roger a thank-you card sometime. He'd love it. Try it out for yourself and let me know. Just remember you heard it here first. P.S. I anticipate a follow-up based on teaching it and feedback. For some quick feedback click here, for a simple Q & A on this click here. Photo credits when credits are given, in order: Federer f/h solo, tvnz_images/sports/tennis; Federer b/h solo, frameshot.com; Federer f/h solo #2, forum site; Agassi f/h left, Getty Images; Agassi f/h right, bobmansour.com; Federer large solo b/h, tvnz_images/sports/tennis; backhand montage: Agassi, Reuters; Henman, tennispro.com; Henin, Darren England/ALLSPORT, Tennis Magazine, 10/96; Edberg b/h, Mel DiGiacomo, Tennis magazine, 10/96; Federer with Edberg, Reuters; two handed backhands: Hingis, Ron Angle, Tennis magazine, 11/99; Moya, Ron Angle, Tennis Magazine, 9/99; Seles, Mary Schilpp/CLP, Tennis Magazine, 04/00; Roddick, Ezra Shaw/ALLSPORT, Tennis magazine, 07/01; Davenport, USTA High-Performance Coaching newsletter, Vol. 3, No. 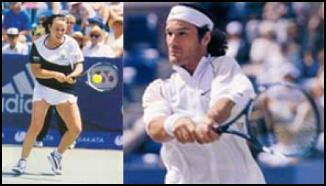 2/2001; Federer and Kuerten: Federer, USTA High-Performance Coaching newsletter Vol. 6, No. 4/2004; Kuerten, USTA High-Performance Coaching newsletter Vol. 8, No. 2/2006; Davydenko, Tommy Hindley/Professional Sport, Tennis magazine, 8/06; Galarraga, AP, LA Times; Rose, LA Times, 9.12.85; Borg, from "Hitting Blind," Stein/Slatt, Beaufort Books, Inc., and I think all photos are from Russ Adams.